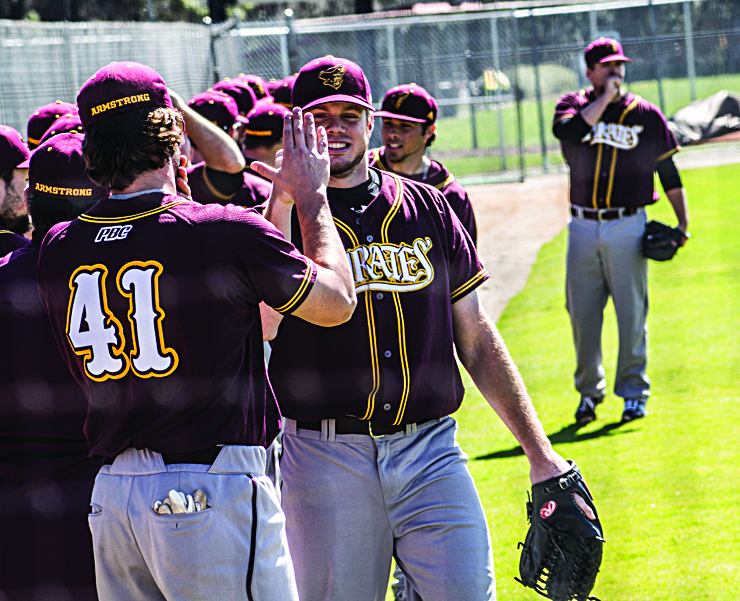 The Armstrong Pirates baseball team entered the weekend series with the Lander University Bearcats looking to extend their four-game win streak. They did just that with their fourth series sweep of the season. The Pirates began the series with a doubleheader March 7 and they used an 8-1 scoring stretch in the early innings to seal the victory in game one. Junior JT Phillips got the scoring started for the Pirates with the first of his three RBIs on the day with a single in the bottom of the first. Junior Cody Sherlin helped extend his team’s lead in the bottom of the second inning when he roped a triple to right field, scored two runs, and was able to advance home after a throwing error at third base. Seniors Tyler Avera and Zach Lance each brought home two runs in the third and fourth innings after Avera reached first on an error and Lance laced a single into right field. Junior Corey Kafka’s day ended after he gave up a two-run homer in the sixth inning. He finished with six strikeouts and four hits for the win. The Pirates withstood another home run in the seventh while adding on two more runs in the eighth to take the first game 10-6. The second game saw less runs, but just as much excitement as the Pirates and Bearcats went to battle in a war of defense. The Pirates used junior Pete Nagel’s ten strikeouts to slip by with a 2-1 victory. Junior Will Austin recorded an RBI single in the bottom of the second inning while Phillips recorded one of his own in the bottom of the third inning to give their team the definitive lead in the early stages of the game. The Bearcats’ lone run came off of a wild pitch in the sixth inning that allowed Weston Lawing to score. The Pirates held on to pull off the victory and give Nagel his second decision and win of the season. The Pirates’ defensive play is certainly what won them the game. On Sunday, it was a late inning rally that sealed the 4-3 victory and sweep for the Pirates. The Pirates found themselves in a 3-1 hole in the bottom of the eighth inning when senior RJ Dennard cracked an RBI double and set up Phillips with runners at second and third. The Bearcats intentionally walked Phillips which brought junior Berry Aldridge to the plate. Aldridge grounded hard to the third baseman who stepped on the bag to record the second out, then made a costly throwing error which allowed two runs to score and pushed the Pirates up 3-2 going into the final half-inning. Junior Tyler Graham shut the door in the ninth by striking out the leadoff batter then getting the second batter with a ground out. Then two singles later, Lander had the winning run on first base. That’s when sophomore right fielder Ryan Patterson made an amazing superman style game saving catch to preserve the win for the Armstrong. Patterson’s catch was so remarkable it made the Sportscenter’s top 10 plays of the day on ESPN. With the sweep, the eighteenth ranked Pirates moved to 16-3 and 9-2 in the Peach Belt Conference. They will play a non-conference series with Tusculum starting with a doubleheader on March 14.